Soppe's system of management for pig milk replacer is the only technique proven to help you get More Milk Out of Your Sows! 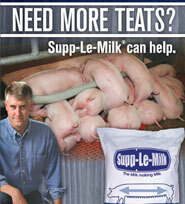 Click on "Supp-Le-Pigs" to see how using Supp-Le-Milk with this Early Pig Care can help you achieve this! and save you time and money. Using Supp-Le-Milk with Individual Litters? Using Supp-Le-Milk with Multiple Litters?